We in Wisconsin are a tough bunch. At the first sign of spring we cast aside our winter coats and hats, come out of hibernation, and reclaim the outdoors as our own. But, spring really arrives with the start of the outdoor Dane County Farmer’s Market, a weekly obsession for locavores, families, and even occasionally the random still half-drunk college student looking for spicy cheese bread and strong coffee. The Farmer’s Market starts in April, and discounting the hoop house spinach and the hot house tomatoes, some of the first local produce to show up includes sorrel, watercress, asparagus, and ramps. Asparagus and I are old friends, but not so much the rest of that crew. This year, I decided to do something about that, and, without knowing what I’d do with them, this Saturday I bought ramps. Ramps are wild leeks, with a taste that leans more to garlic than leek, but not nearly as sharp and pungent. They have beautiful jewel green leaves and small white bulbs. And, I can now report, they are darn tasty. Meanwhile, I stumbled across this week’s “Blogger Secret Ingredient” post by Aubree Cherie of Living Free. And the secret ingredient is…. cashews! I’d not seen the Blogger Secret Ingredient challenge before. But, I love cashews, and it sounds like fun. And the possibility of winning the Maison Creole seasoning mix? Even better. Hm…ramps and cashews…cashews and ramps…. Oh, and asparagus. What to do. 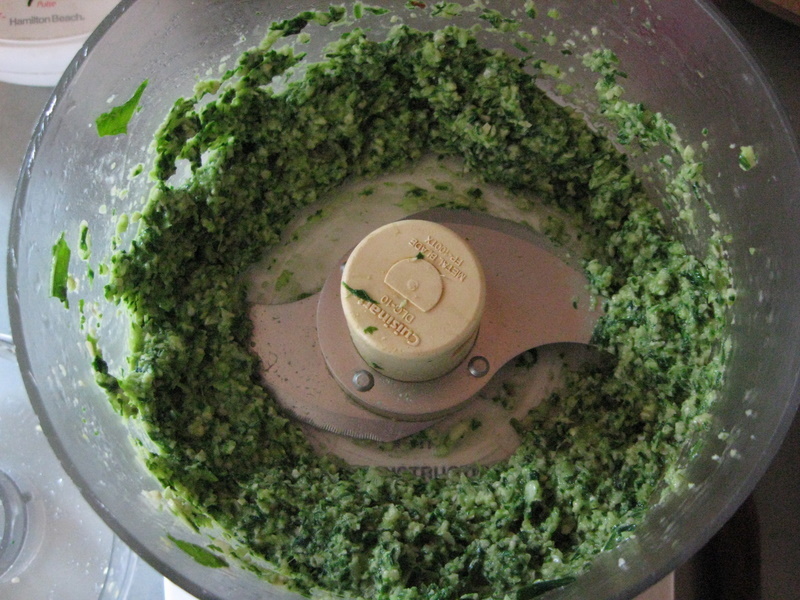 I know – pesto! Preheat oven to 375°. (I actually used my toaster oven, which has a convection setting. You may want to go with 400° if using a conventional oven.) Place asparagus on an oven safe pan or cookie sheet. Drizzle with 1 T. olive oil and spring with course salt. Put 1/2 of the soaked cashews on the pan with the asparagus. Try to keep the asparagus and cashews on separate ends of the pan. Roast for approximately 10 minutes, turning once or twice, until cashews are toasted and asparagus is crisp-tender. If either is cooking faster than the other, you can remove the one that’s cooking faster. You DID keep them on separate ends of the pan, right? I cook my asparagus whole, and then cut it into bite size pieces when it’s done. It just seems easier that way. Meanwhile, cook the pasta in the boiling water until al dente. Drain the pasta and toss with the pesto and asparagus. Plate servings and top with a few toasted cashews. 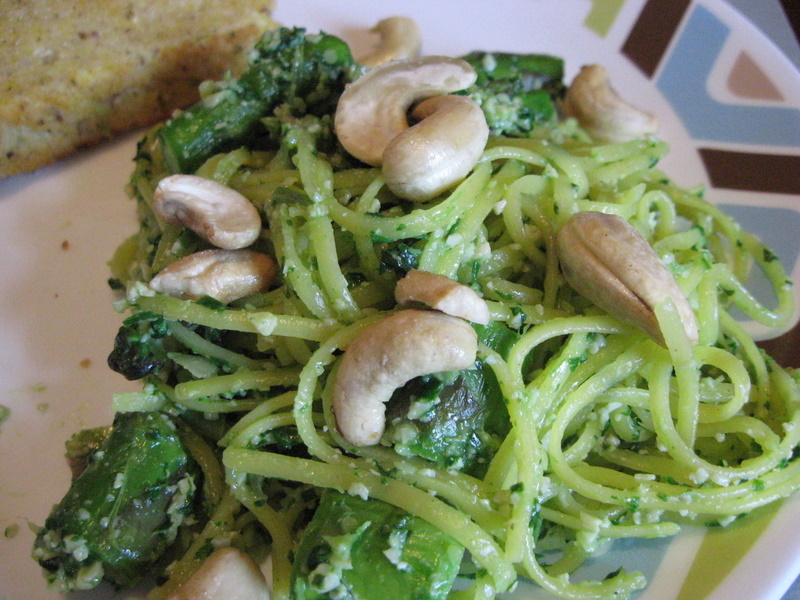 This entry was posted in asparagus, cashews, pasta, vegan. Bookmark the permalink.